• Dimensions: 93 × 25 × 21 mm. • Gross weight - 0.14 kg. Do you often have the energy in your phone? In principle you always want me to have, unfortunately in the connection that you have a lot of different things, you forgot to recharge. Unfortunately, such an event causes your plan to malfunction. At this point you are angry for the whole world. You have to pretend to everyone and to yourself. How to prevent such problems? Just buy a portable charger. Sometimes you can find cheap powerbikes with reasonable parameters. The power bank presented here belongs to a very small group. It has a capacity of 2600 mAh. Typically similar capacities have phones. The conclusion that comes out of this is that this powerbank can only charge your phone once. Yes, because it is his function. Its biggest advantage is that it is very small and has little weight. Thanks to the small size, you can hide energy banks anywhere (trouser pocket, purse, backpack) in a place where you will not be disturbed. At the same time, as mentioned above, these banks are of little importance, it also makes you feel that it is not. This is one of the few powerbanks of such a small capacity that has a display. This is a great solution. The display shows the percentage of energy in the portable charger. You can always be sure of how much energy remains in your device. DOCA produces professional equipment. 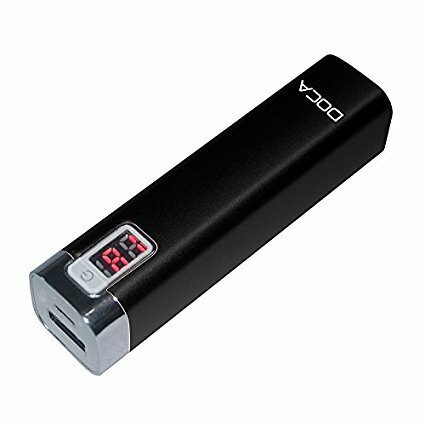 Portable phone chargers accumulate power for up to five thousand hours. You can then charge this powerbank and hide it for example in a purse and when it is needed, we will find it and use it. Mobile chargers may also charge other devices than phones. Power bank can also charge the tablet. So the device is ideal for charging MP3, MP4. You can also use mobile games, digital cameras, and more. The world has become very "busy", so it is worth to make life easier, not to wonder if the phone was charged or not. Choose a professional power bank.